Tesla today released an over-the-air software upgrade that enables five new autopilot functions for its Model S sedans, including a beta version of Autosteer and Auto Lane Change. While Autosteer is more akin to an enhanced adaptive cruise control and lane keeping assist than a fully self-driving vehicle; it does automatically maintain distances from other cars around the Model S.
Tesla founder and CEO Elon Musk has said his company will produce a fully autonomous vehicle within three years. In the meantime, Tesla's new software upgrade (version 7.0) enables many of the functions that fully-autonomous vehicles will someday also have. "Today's update increases the driver's confidence behind the wheel with features to help the car avoid hazards and reduce the driver's workload," Tesla said in a statement. "While Model S can't make traffic disappear, it can make it a lot easier, safer, and more pleasant to endure." Automatic Emergency Steering and Side Collision Warning systems are activated by sensors and warn a driving of an impending impact. Autosteer, for example, uses a variety of features including steering angle, steering rate and speed to determine the appropriate maneuvering operation. Autosteer assists the driver on the road, but it still requires a driver to keep his or her hands on the steering wheel. Another feature, Auto Lane Change, is engaged when the turn signal is used. The Model S will move itself to the adjacent lane when it's safe. Automatic Emergency Steering and Side Collision Warning systems are also new to the Model S upgrade and are enhancements to the vehicle's active safety capabilities. The Model S can now sense the range to other vehicles or objects and alter driving when they're too close. When the car detects an object close to its side, a set of lines will appear alongside the virtual Model S image in the car's instrument panel to alert the driver. Finally, the Model S can now parallel park itself, a feature many new models from other carmakers already have. For example, Lexus introduced auto-parking in the U.S. with its LS sedan in 2007. Ford, Toyota, BMW, Range Rover and Mercedes Benz also offer parking assist on some models. 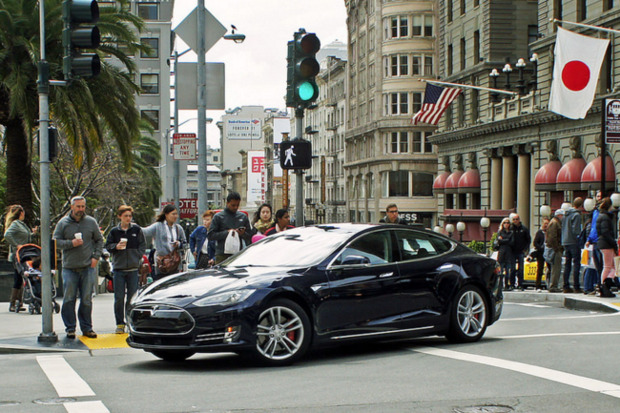 Tesla's Autopark feature works when the vehicle is being driven at low speeds around cities. A "P" will appear on the Instrument Panel when the Tesla detects a parking spot. The Autopark guide will appear on the touchscreen along with the rear camera display, and, once activated, Autopark will begin to park the car by controlling steering and vehicle speed. Pressing the brake will cancel the Autopark function.